Guests with a wide range of opinions were invited to share their perspectives when Anderson Cooper convened a town hall in Washington to discuss the current and future state of gun laws in America. Judging by the audience reaction at George Washington University, the conversation was impassioned but respectful. Although there were disagreements, everyone benefitted from hearing both sides and getting to the crux of the issues. The topics included personal safety, mental health, the culture of violence, politics, background checks, banning certain types of guns, second amendment rights, and much more. The program was enriched by the activists and experts, and also by people who told their personal stories. The next day Anderson, Dr. Sanjay Gupta, Jeffrey Toobin and producer Jack Gray met again via Google+ Hangout to answer your questions and address the points you made on social media. If you missed the program or the Hangout, find video highlights below. Let us know your thoughts on the gun debate in a comment or by tweeting @AC360. Tune in tonight at 8 and 10 p.m. ET for a special edition of AC360°. Anderson Cooper hosts live from Gaza. Wolf Blitzer is live in Jerusalem, Arwa Damon and Ben Wedeman report live in Gaza City. Tune in tonight at 8 and 10 p.m. ET for a special edition of AC360°. Anderson Cooper hosts tonight live from Gaza. AC360 will cover all sides of the conflict. Wolf Blitzer is live in Jerusalem, Arwa Damon and Ben Wedeman report live in Gaza City. Hangout with Anderson! What do you want to ask? We had so much fun during our last Hangout that we decided to spin it off into a semi-regular web series. Because, let’s be honest, there just aren’t enough ways for you to distract yourself on the Internet. 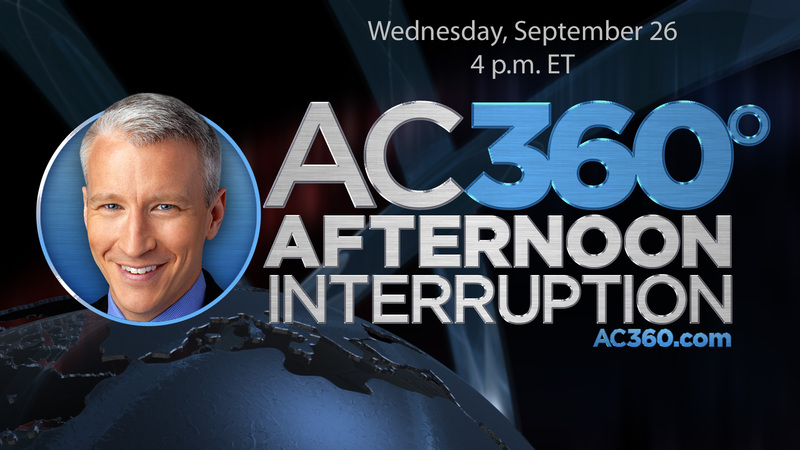 We’re calling it the AC360° Afternoon Interruption. Anderson will be joined by a rotation of CNN personalities for a 15 minute chat (or shorter if people start cursing and arguing, which we’re not ruling out). AC360° producer Jack Gray will moderate the discussion, which will include your questions – so post them here, Facebook, Google+ or tweet @AC360. At 4 p.m. ET on Wednesday, September 26, Anderson and Jack will be joined by Dana Bash and Jeff Toobin. What do you want to ask them? It’s going to be a departure from what you see on CNN. No news analysis, no politics. We want it to be a fun, relaxed show where your favorite CNN folks can let down their guard, kick back, and talk about everything from the crazy stuff that happened during the day to good books and movies to Wolf Blitzer’s new eyeglasses. You know, important things. So submit your questions and interrupt your afternoon with us on Wednesday at 4 p.m. ET, right here on AC360.com. This week Anderson Cooper reports live from the center of the action in Charlotte, North Carolina. He'll talk with political insiders for analysis on the key issues getting attention at the Democratic National Convention and in the election this fall. Watch CNN's coverage starting at 7 p.m. ET Monday – Thursday and check out the network's Live Blog, plus you can tweet with @AndersonCooper and @AC360. 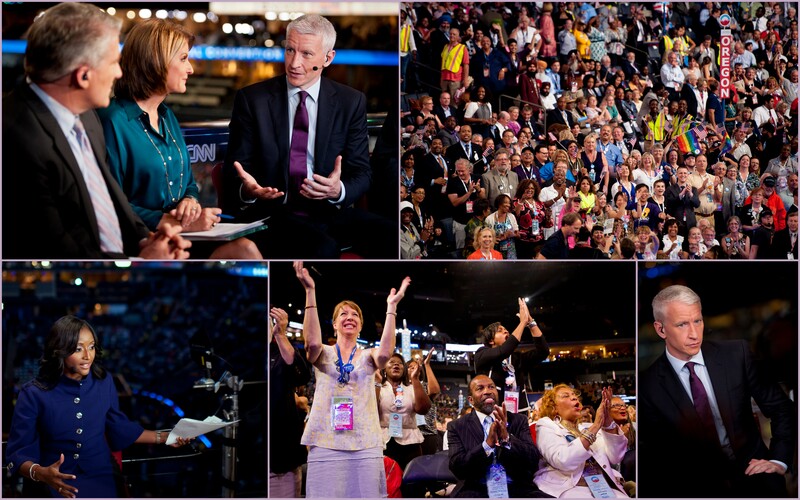 Anderson Cooper, Wolf Blitzer, and many others from CNN's Political team of anchors, analysts, and strategists hosted a week of live coverage on CNN from the Republican National Convention. Shortly before the RNC was set to start, Tropical Storm Isaac's uncertain path targeted Tampa and eventually turned west aiming toward the Louisiana/Mississippi part of the Gulf Coast, charting along a path similar to Hurricane Katrina, which made landfall close to the same date 7 years earlier. Anderson left Tampa en-route to New Orleans on Monday to report the latest on the Hurricane. After Isaac made landfall, and slowly lessened in power, Anderson returned to Tampa on the night Mitt Romney accepted the Republican Party nomination for president. Behind the scenes photos of Anderson and his CNN team in the field covering Hurricane Isaac. We're taking you behind the scenes at 360! 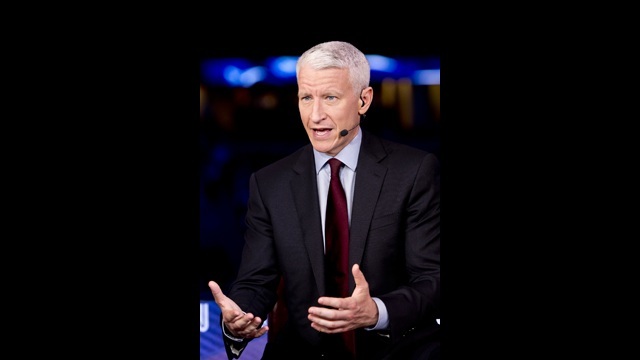 Follow @AndersonCooper360 on Instagram for exclusive pictures inside our newsroom and control room, and photos of Anderson's travels and reporting. And don't forget to follow @AndersonCooper too! Not on Instagram? Go to Instagram.com to find out how to get the free app. Here at AC360, we are fortunate to share the newsroom with Christiane Amanpour and her team. They “moved in” last April, when Christiane launched a new program on CNN International. Tapping into her vast experience reporting on events around the world, "Amanpour" provides in-depth analysis of the most pressing global news and features high-profile interviews. Christiane’s career started in Providence, Rhode Island, where she was in charge of the graphics that went on on-air at a local TV news station. Christiane aspired to become a foreign correspondent, and she began on that path when she left Providence and accepted a position at CNN. In 1983, just three years after the network's founding, she got her start with the company as an entry-level assistant on the international assignment desk in Atlanta. Christiane credits her background in helping her ace the job interview. "They asked me a few questions, all of which I knew because they were mostly about Iran and the revolution," she says, "and I'd lived it so I knew those questions."